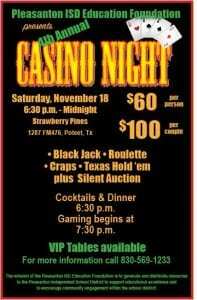 The Pleasanton ISD Education Foundation will host its 4th Annual Casino Night this Saturday, Nov. 18 from 6:30 p.m. to midnight at Strawberry Pines located at 1287 FM 476 in Poteet, TX. Costs to play include $60 per person and $100 per couple. Games to be played include Black Jack, Roulette, Craps and Texas Hold ’em. A Silent Auction will also take place. VIP tables are available. 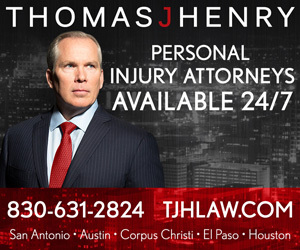 For more information, please call (830)569-1233.